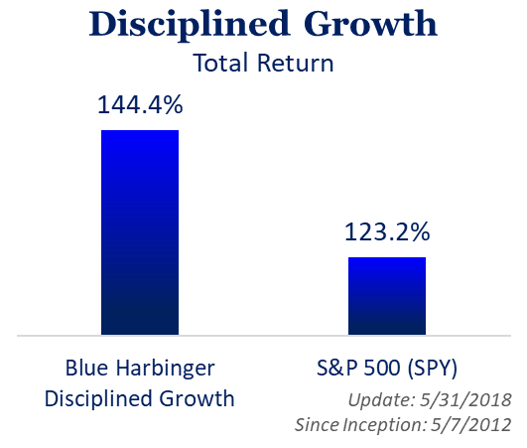 All Blue Harbinger strategies delivered positive returns and outperformed the S&P 500 in May, thereby continuing their growing long-term track records of outperformance. This report provides details on performance and holdings, and provides updates on our biggest movers over the last month. We also provide a dashboard on market sector dynamics, that we believe is worth considering. St. Louis Missouri headquartered Industrial equipment company Emerson Electric posted strong gains during the month, delivering a total return of 7.4%. The shares were up significantly more following an expectations-beating earnings announcement to start May, but gave back some gains following the announced acquisition of Aventics (producer of smart pneumatics technologies that power machine and factory automation applications). 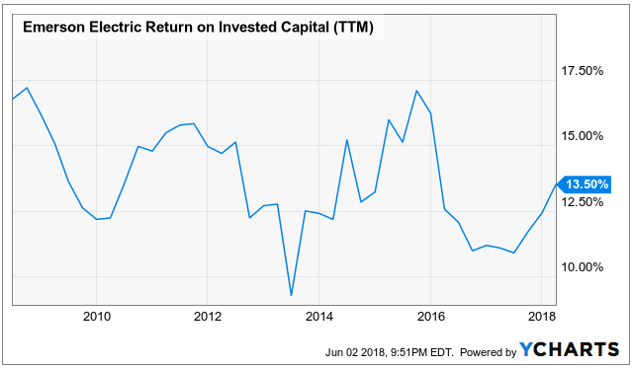 This is a company that continues to deliver high returns on its invested capital (see below), as there are high switching costs for customers which give Emerson some healthy pricing power. What’s particularly attractive about this company is that customers tend not to leave Paylocity because they don’t want to disrupt their payroll and human resources functions. We believe this is a company with significantly more growth on its short- and long-term horizons. Further, once Paylocity stops focusing so heavily on sales, margins will rise significantly, and this will essentially become a cash cow business. After a brief hiccup in its price following fear of CEO Mark Zuckerberg discussing privacy concerns in front of Congress, the shares have resumed their upward trend (did you buy the dip?) and they have significantly more upside ahead as mobile advertisement revenue is a truly enormous opportunity that customers are willing to pay up for because of its effectiveness. Not to mention Facebook’s growing war chest of cash. Here is a look at FB recent history of bearing expectations. Facebook continues to experiment with virtual reality which could eventually become a major new source of revenues. WPZ had a great month of May gaining over 11% as it was announced that Williams Companies (WMB) will be acquiring the 26% of WPZ that it doesn’t already own, and they’ll being doing so at a premium. The transaction will simplify the corporate structure of the gas pipeline and infrastructure group. Based on a recent Morningstar report, the simplification transaction will further improve the organization’s cost of capital, deleverage the partnership, strengthen distribution coverage, and reduced the need for equity issuances over the next few years. Not to mention William’s continuing access and long-term contracts related to prime location pipeline and infrastructure. Omega announced expectation-beating quarterly earnings last month which helped reassure investors’ concerns about dividend coverage considering several of its struggling facility operators. Specifically, Omega announced Q1 FFO of $0.78 beating expectations by $0.04, and announced revenue of $220.2M (-5.0% Y/Y) beating street expectations by $5.35M. As part of our strategic positioning, in the first quarter of 2018, we disposed of $98 million in assets. And including assets held for sale, we’re evaluating over $250 million in additional asset sales in 2018. The revenue reduction related to our $98 million of first quarter assets disposed is $10 million, while the trailing 12 month cash flow in these assets is $4 million. The cash flow on these assets did not cover the underlying rent, yet we were able to achieve sale proceeds that equates to rent yields of approximately 10%. Our strong sales results today reflect the continued appetite for SNF assets by local market private buyers. We’ve made great progress addressing the operators; Orianna is in the middle of a controlled Chapter 11 Bankruptcy process; Signature is being resolved outside of bankruptcy; and Daybreak is paying current rent obligations timeline. Later in the call, Dan will provide more detail regarding portfolio workouts. We continue to own our shares. ADP provides payroll processing and benefits administration to large companies, and it benefits significantly from a strong economy, particularly increases in employment. This is also a company that has increased its dividend every year for the last 40 years. This company has highly defensible economic moats considering once a customer sets up with ADP—the switching costs are too great. ADP revenue and profits continue to grow, a trend we expect to continue. A Powerful Stock To Buy On A Pullback--Such As The Current Pullback. And even though the stock just rallied, it is still considerably cheaper than it was, and it has significantly more upside, in our view.